Many visitors to Barcelona, first time or otherwise, will often make the obligatory trip to Park Güell (pronounced very similar to ‘way’ not ‘gwell’ as I have often heard and said myself). Personally I think this is foolish. Of course Gaüdi’s work is fascinating and the park does provide some good views of the city, but the hoards of tourists, grafittied cacti and lack of open green space to just sit and relax really spoil the enjoyment of it for me. Instead you should head to Montjuïc, the lush green parkland, topped by the castle overlooking the port and the Mediterranean Sea. Although it looms over the city, it’s very much ignored by many visitors and residents, but I think with it’s various small gardens, some manicured, others a little wilder, the Miro museum building, Olympic swimming pool, stadium and facitilities it’s one of the city’s most precious gems. 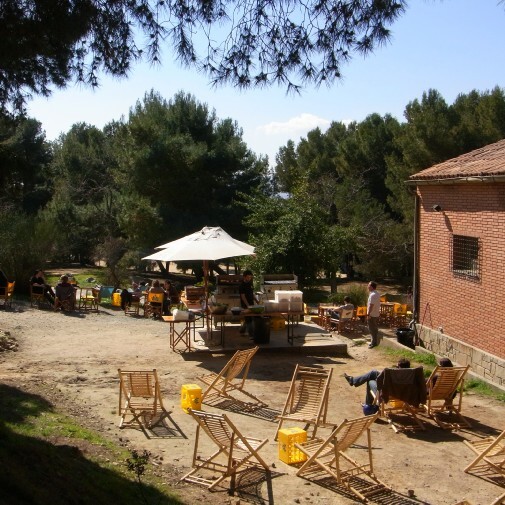 The true jewel of the park, however, is La Caseta del Migdia, the open air bar that nestles under the pine trees a short walk behind the castle. 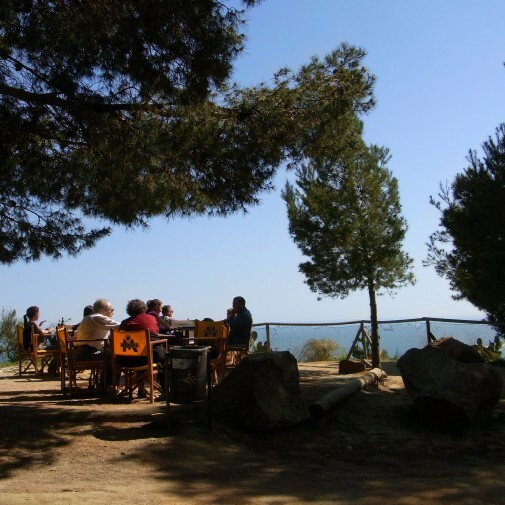 The path that runs around the castle, scented by the sweet smell of the pine mixed with the smoky aromas of the barbeque, leads you to the open-air tables, deckchairs and view out to sea. Now, I’m not going to kid you that this is a beautiful, uninterrupted ocean view, as the bar is tucked behind the castle it looks out onto the container port. 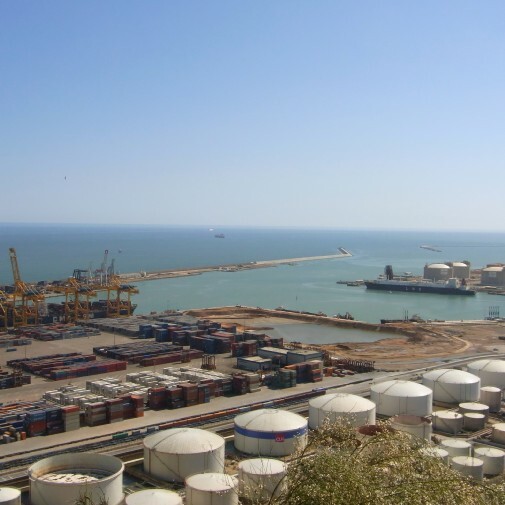 However, as you lean back into your seat all you take in are the clear blue skies and aquamarine sea beyond the cranes, storage tanks and containers. A plate of barbequed botifarra, chicken, salad, toast and sweetcorn is the tucker on offer here, fresh and decent quality it’s a tad on the costly side at 12€ but a price that’s probably been calculated to take in the setting and the fact that this can surely only been a profitable venture during the spring and summer months even though it is open all year round. 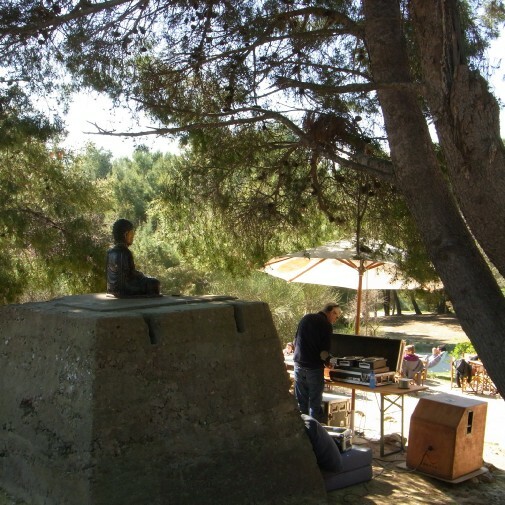 Reggae, soul, funk and laidback tunes, at an appropriately low volume, emit from the decks and provide a perfect accompaniment to a sun-drenched afternoon under the branches and rays. Before you set off, throw a good book, your camera and a sweater in your bag. Those stunning views as you climb up to the castle, either on foot or by cable car, are unmissable. 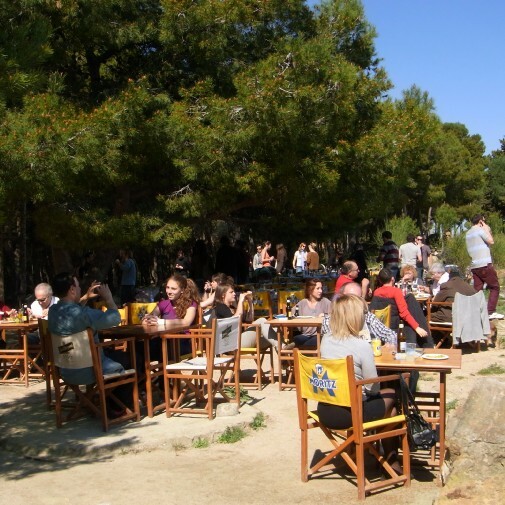 As for the sweater, being above the city, even in summer there can be a cool wind up on the hill, you don’t want a few goosebumps to spoil a laidback, balearic style afternoon. Las Caseta del Migdia, Montjuïc Park. Open Thursday to Sunday all year. Walking: The easiest way is to leave Paral.lel and walk up C/Margarit. 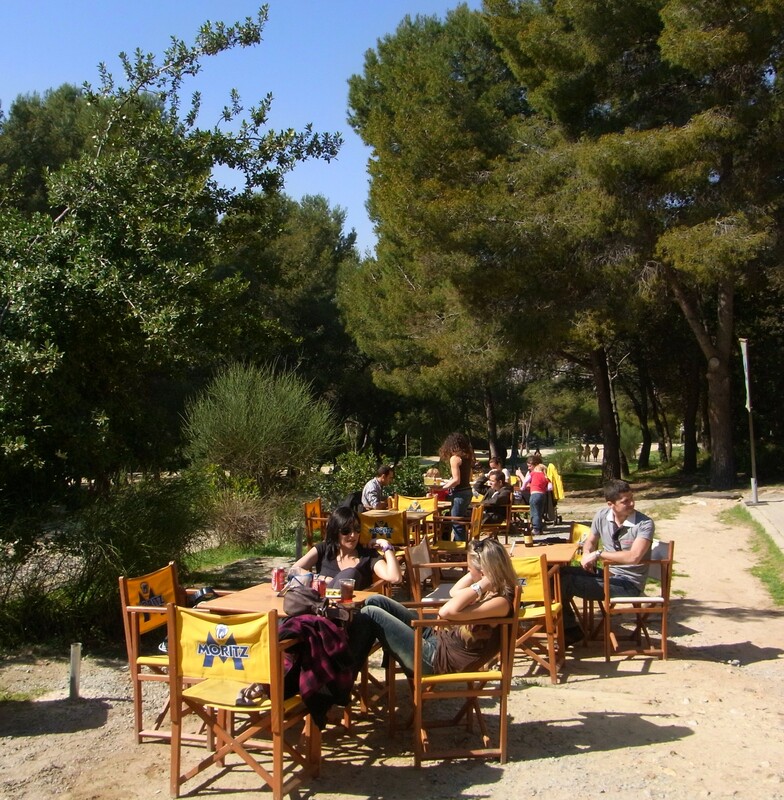 This leads to a steep slope and about 200 steps which brings you out onto Avinguda de Miramar. At the top of the steps, turn left and you will meet the cable car station. From here walk through the ‘Jardins de Brossa’ until you hit the Carretera de Montjuïc. Walk uphill and you will eventually see the castle and final cable car station. If you stand in front of the station as if you’ve just come out of it, turn right and follow the path round to the rear of the castle, if you don’t divert from the path it will bring you out under the pine trees and directly to the bar. By funicular and cable car: Take the metro to Paral.lel and then at this station take the funicular up and then join the cable car which will take you to the castle. The current cost of the cable car is 8€ return. From here, turn right out of the cable car station and follow the path round to the rear of the castle, if you don’t divert from the path it will bring you out under the pine trees and directly to the bar. I can’t remember where I heard the ‘gway’ pronunciation but from what I’ve learnt in my Catalan classes it sounded correct. 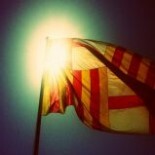 I will check with my most Catalan student last week and edit it. La Caseta del Migdia is one of my favourite places in the city, feels like you are on one of the islands and not just above the hustle and bustle of the city. Try and go if you get chance next time you’re here. Today I wrote Güell on the board at school and asked my 8 teenage students how it was pronounced. In unison they all shouted ‘way’. Catalan pronunciation takes some getting used to but I love that I learn something new every day. I found the double L in Catalan difficult to pronounce at first but 10 years with my Catalan husband has drilled it into my tongue! Thanks Su-Lin. I’ll have a look at this. 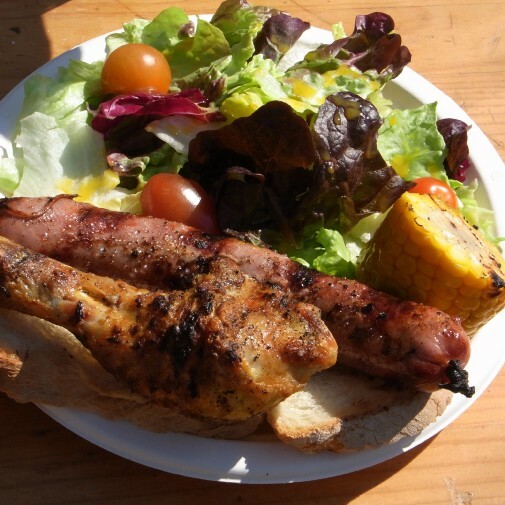 This entry was posted on March 24, 2011 by butterytoast in Bars, Fast food / street food, Poble Sec and tagged barbeque, chicken, La Caseta del Migdia, Mediterranean Sea, Montjuïc Park, salad, sausage, sweetcorn.